I Was Looking For a Game That Starred Empathy. I Found it Behind All the Zombies. Last spring, I read a novel called The Passage, and I'm re-reading it again now. The book posits a scenario that in its broad strokes should be familiar by now to any gamer: a secret military science program goes horribly wrong and creates a race of man-eating, once-human monsters that more or less doom humanity. Civilization crumbles; the world goes to hell. Close to a hundred years later, a group of survivors struggle to continue life and maintain order in a wild and dangerous, mostly-collapsed world. The novel shot strait into my all-time top ten not on the strength of its prose or its plot (although both of those are compelling), but rather on the strength of its empathy. It is perhaps the most compassionate book I have ever read, treating every imagined soul in its pages—even the ones who aren't particularly good people, or who are actively bad ones—with a measure of humanity and understanding that I've rarely seen in fiction. I didn't even realize until I was more than halfway through The Passage, the first time, that I was technically reading a zombie survival horror story. I was too wrapped up in feeling what made everyone tick to worry about the external threat. And as I've been re-reading the book again this summer, realizing how in many ways The Passage tells the same story many video games do, I've been wondering: is it even possible for a game to get as intimate with its characters, and to make the player empathize with them as much, as this book does? I was all prepared to write last week that no game had ever put me in that same position, and then I picked up The Walking Dead from the Steam sale. Episodes one and two run about three hours each, give or take; I finished both with ease over the weekend. While the small details vary widely, in many ways The Walking Dead tells the same story The Passage does: monsters who once were people pose an existential threat to humanity, and the basic blocks of American civilization crumble almost instantly under the strain. Meanwhile, the drama posed by the external threat is, in the day-to-day, secondary to the drama created by diverse people with diverse values trying to live and work together to survive. And in both cases, fellow survivors can be far worse enemies than mindless monsters ever were. 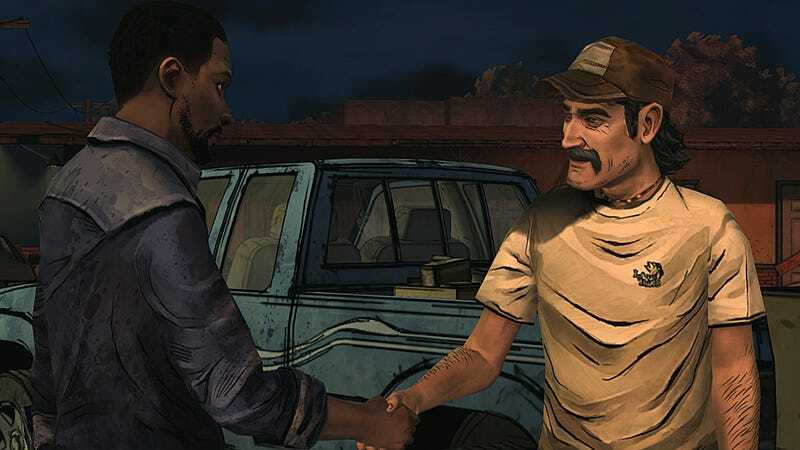 The Walking Dead is, in some ways, one of the hardest games I have ever played. It's not that a high level of game-playing skill or timing are required. The difficulty comes from being required to make a choice when there are no right or wrong options. You just met stranger A and stranger B at the same time, ten minutes ago. Now, they're both in danger and you're in a position to save a life—but only one life. How do you choose? Worse still are the moments when you the player can tell what the "right" action is, but the game makes you actually follow through. The opening of episode two feels, still, like about the worst thing I personally have ever done in a video game. I had Lee take that action because it seemed like the choice likely to have the best long-term outcome, but it didn't pay off. I have had strong emotional reactions playing many games. Mass Effect 3, for example, made me feel genuine grief, mourning, and sorrow. BioShock gave me a true sensation of dread—not just fear or terror, but active dread. But even in the best of games, I've always felt a certain kind of detachment that kept me from experiencing that level of compassionate understanding I found in reading a novel. It's not just the apocalypse bringing out both the best and the worst of humanity that makes certain stories sing to the soul. That's a well-worn trope in film and other fiction, and some works pull it off better than others. It's not the wide-scale wipeout of cities and countries that gives a work it soul. As morbid as it sounds, what seems to give a tale its kernel of compassion is death. Death is both the central meaning of games, as well as completely meaningless in many of them. We shoot a guy or a hundred guys or a thousand guys. We face wave after wave of henchmen or aliens or goons and mow them down in whatever way we can. We play against other human-driven characters, and rack up kill vs death ratios. We die a hundred times a day, in a hundred ways, and look at it as a challenge. Death of the avatar is but one more obstacle to overcome. But what we see in fiction that truly, deeply engages with what it means to be undead, with the true horror of that state, is a healthy respect for death as the true marker of life. Sometimes death is a mercy, and The Walking Dead and The Passage both recognize that fact, making every corpse and every kill deeply personal to all their characters. Perhaps, then, compassion goes hand in hand with mercy. For a game to put us in a position where we can feel its characters souls, we must understand when and how they would feel merciful to others. If ever. Lee Everett, after all, doesn't have to be a good man. He is if the player says he is and steers him as if he is. It's not a foregone conclusion. The Walking Dead, for all that it comes the closest to the level of grace I felt The Passage giving its characters, still doesn't quite accomplish the same thing. There are characters the player can never understand; there are parts of the world the player can never see. And it's still a game: "use band-aid with precocious girl" is still ultimately the same kind of puzzle we've been solving for thirty years, even if presented differently. But "still a game" is not the same as "just a game." There's no "only" about it. A game that looks seriously at empathy, hope, faith, life, and death—and that actually makes the player examine the concepts, rather than paying lip service to them in cut-scenes alone—is the kind of game I hope to keep playing more of. Compassion is a rare trait for a game to display. I hope The Walking Dead keeps displaying it toward Lee. And I hope to play a game in the future that finds a way to make us value life without having to lose civilization to go along with.